by Jackson Donaldson If you ask any hip-hop fan who their top-five favorite MCs are, you’re bound to hear Eminem’s name somewhere on their list. He defined an entire era of the genre with his ability to tell stories through his clever, funny and sometimes shocking lyrics. It was his star power that drew many to see Curtis Hanson’s 8 Mile when it was released in 2002. Hip-hop heads and non-rap fans alike were treated to a character piece that is filled with riveting rap sequences, a fully realized environment and a stellar performance from Eminem. The story takes place in Detroit, a city filled with violence, drugs and houses left in shambles. It centers on Jimmy “B-Rabbit” Smith Jr. (Eminem), a blue-collar worker with a minimum-wage job who has to put up with his drug-addicted mother (Kim Basinger) and her abusive boyfriend (Michael Shannon). While dealing with all of this, Jimmy is trying to become a professional rapper, frequently participating in rap battles and saving up his money for studio time. 8 Mile is about one man’s quest to achieve his goals despite his upbringing and economic status. Every character becomes a roadblock standing in the way of Jimmy’s ambitions, including his friends. Even though the characters hinder Jimmy’s growth as a person, they help shape his art and the man he is today. The people in his life teach Jimmy that he has to go after what he wants, and that he can’t rely on anyone else to get him there. He’s written as a no-nonsense character who leads rather than follows, doesn’t take handouts and doesn’t take any smack talk. The rap sequences are the highlights of the film. All of them have the adrenaline and intensity of an action scene, while also possessing the emotional weight of a dramatic scene. Some of these sequences take place in an underground rap club while others take place during the lunch hour at work or in a crowded parking lot. When Jimmy starts rapping, people begin to take notice; no matter how the scene starts, it always ends with a crowd of people blown away by Jimmy’s lyrical skills. Seeing the huddled onlookers going crazy after every bar he spits adds an energy to these scenes that is unmatched by anything else in the film. Each rap battle teaches us more about Jimmy. We see his character progress from the opening scene where he is unable to rap a single word, to the closing scene where Jimmy spits the best verses of the entire film. Each word spoken relates back to Jimmy’s life and his lyrics are dark, funny, mean and aggressive, just like the environment they’re proclaimed in. 8 Mile captures Detroit’s strong presence. I have never been to The Motor City personally, but when watching this film, one feels like they’ve lived there for years. Detroit is a character in itself, shaping the personalities and motivations of the characters and scenes. We see the decrepit buildings that line the streets, the trailer park that Jimmy and his family lives in, and the club where Jimmy raps. All of these places feel dirty and abandoned, and they carry a strong sense of hopelessness. Every location Jimmy finds himself in feels broken down and unwanted, mirroring his presence in the rap game. This story is autobiographical for Eminem. While he does not play himself, Eminem plays a character with a background similar to his own. Eminem was born in Detroit and lived in a trailer park with his mother and her many boyfriends. The various characters, situations and rap battles in the film are much like the ones Eminem faced as a young man. These similarities are why he is able to give such a powerful performance. In his first role, Eminem holds his own against veteran actors Kim Basinger, Brittany Murphy, and Michael Shannon, who all give great performances in this film. He is the driving force of the film and everything that he says (or raps) feels authentic. His portrayal of the reserved “B-Rabbit” is convincing and he doesn’t miss a step when the script occasionally demands he explode into a more aggressive persona. 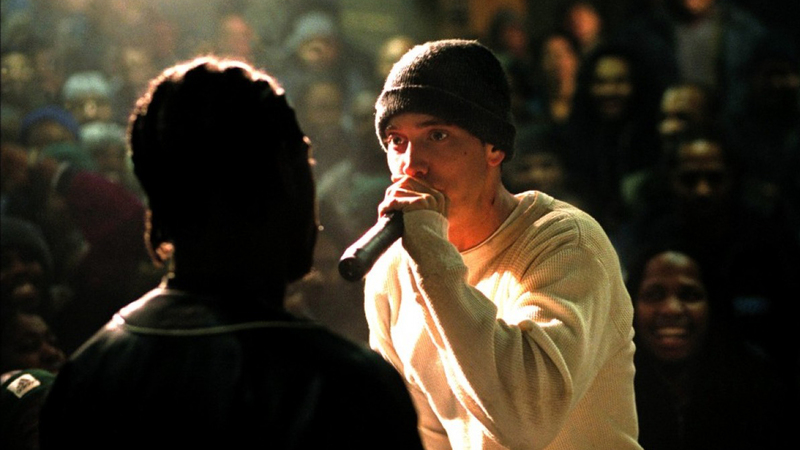 8 Mile is a must-see film for fans of rap music. In lesser hands, Jimmy would come off as a whiny kid: a glorified complainer with big aspirations. Instead, Hanson and screenwriter Scott Silver (The Fighter, The Finest Hours) portray Jimmy as a fighter — a man who won’t take “no” as an answer despite hearing it time and time again. He is a man who embraces his harsh surroundings and uses them as fuel in his struggle to become a professional MC. And it’s ultimately that relentless drive to realize unwieldy dreams that makes him so easy for any viewer to relate to. Tags: Jackson Donaldson. Bookmark the permalink.